During December we asked you to support Weldmar's Christmas Challenge, to fund our 24/7 Helpline. Our challenge was part of The Big Give’s Christmas Challenge – and donations made from 29th November to 2nd December were doubled by The Big Give’s match funding scheme. At Weldmar, we like to say that we are there for people when they need us most. It can be seen from our recent CQC report that Weldmar services are well regarded and well received. However, in a number of cases, the time we are needed most is in the middle of the night. In 2015, I was part of a 24/7 helpline test specifically for Weldmar patients and their carers. We wanted to see what demand there was for the service and what level of support we would be able to offer the patients and carers on our caseload. The test proved to be a success and allowed us to offer a variety of solutions and options to those who phoned in. 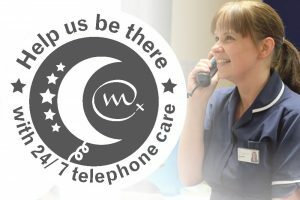 Our phone line was staffed by trained Weldmar nurses who were backed up by the Weldmar doctor on-call. The service was in addition to the teams existing workload and this placed limits on what we were able to offer to callers. Learning from this test, we now know what level of staffing we need to make the phone line most effective for those calling in. In order to allocate dedicated members of staff to the line 24 hours a day we need to raise more funds. If you are able to support this appeal then your donation will directly benefit people like Maureen, who I spoke to during the pilot. Her call helped alleviate what she described as her ‘worst nightmare’ as her husband’s symptoms changed suddenly in the middle of the night. The call was followed up by a doctor’s visit and stopped an ambulance ride to A & E, which they were both desperate to avoid. This year our appeal is part of the Big Give’s ‘Christmas Challenge’ which means that The Big Give will double the value of your Weldmar online donation. This will go towards the extra costs of staffng the phone line overnight. Based on our test and the size of the population in our area, each year we expect to take over 2,200 calls from over 980 patients and relatives. We would really appreciate your support.